Balearic Shearwater, Isla de Cabrera, May 2016. I was very lucky to visit lovely Cabrera earlier in May this year on the recent Birdquest 35th anniversary reunion tour of Mallorca. Isla de Cabrera is the main island of a small archipelago off Mallorca’s south coast. Named after the goats, which once inhabited its rocky slopes it was visited by various ancient Mediterranean civilizations – the Phoenicians, Carthaginians, Romans and Byzantines. It is also said to be the birthplace of the Carthaginian General Hannibal! In the middle ages Cabrera was a haven for Barbary pirates, prompting the building of the castle here in the 14th Century. The pretty island also has a very dark past indeed. In the Napoleonic era Cabrera was used as a concentration camp for captured French prisoners. Of 18,000 who surrendered to the Spanish at the Battle of Bailen in 1808, 9,000 were taken to Cabrera and marooned there. There was no building on the island used as a prison and the prisoners of war suffered intolerable conditions, particularly as the provisioning operation, which were supposed to deliver food to them every four days collapsed and a period of up to three months without food and supplies followed. There were rumors of cannibalism and coprofagia and only 3,600 detainees survived when they were finally freed when peace returned in 1814. It is difficult to imagine this scene of human suffering when walking along the quiet trails around this beautiful island. Cabrera was privately owned until 1916 when it was seized by the military ‘in the interest of national defense’, owing to its use as a refueling and repair station by German submarines operating in the Mediterranean. It remained a military station until it was declared a Foreshore National Park in 1988, 85% of the new park’s surface being sea. The military occupation certainly saved Cabrera from development, which has afflicted much of the Balearic Islands and the island has a wonderful landscape of natural vegetation (spoilt only by a few eyesores, particularly a hideous bank of solar panels plonked on one of its hillsides). The geology of Cabrera is predominantly tertiary dolomite limestone and its vegetation is typically Mediterranean maquis scrub with wild olive trees, Aleppo Pines, scattered Balearic Buckthorn and junipers. Birdquesters on Isla de Cabrera. The main reason for our visit was Cabrera’s two special warblers: Balearic (reaching its highest density in its tiny world range here) and Moltoni’s (at the westernmost limit of its range in the Balearic Islands and particularly easy to see on Cabrera). Both of these adorable little birds delighted us all in giving very instructive, perfect, close views. 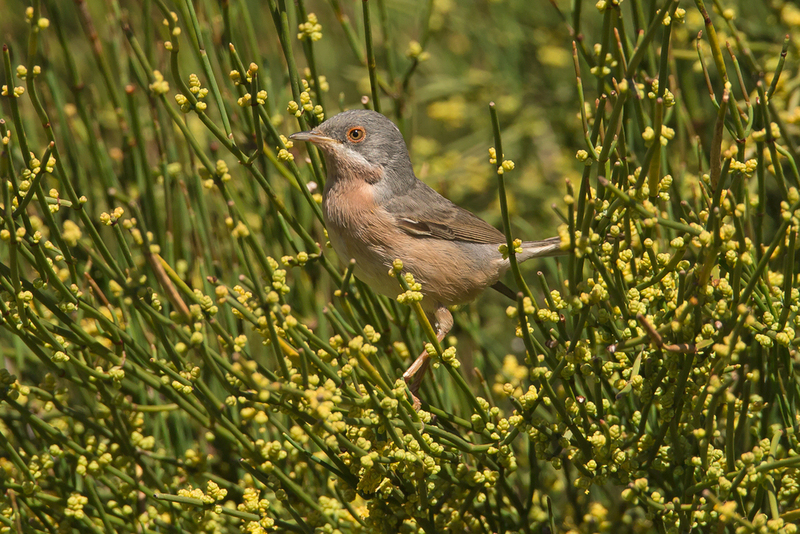 The first, Balearic Warbler, showed immediately, near the harbour but later, it could be seen easily along the quiet trails through the maquis scrub, sometimes foraging and even singing only a few metres away. Like many small sylvias they spend a lot of time foraging low down but they do occasionally show themselves ridiculously even without ‘encouragement’. Most authors follow its splitting off from Marmora’s Warbler but a few do not, notably Birdlife International. The plumage differences are indeed small but they are distinctive, a whiter throat and paler, buffy belly/vent area than Marmora’s is obvious as well as a harsher rattling song. Balearic Warbler (male), Isla de Cabrera, May 2016. Moltoni’s Warbler was a main target for everyone and happily there was a bird holding territory in the ornamental garden of the island’s little museum, like an exhibit itself. It obligingly returned time and again to a small flowering broom bush in the centre of the garden affording some wonderful views and a chance to study its features like the cold ‘salmon-pink’ under parts all the way to the under tail as well as to hear the diagnostic wren-like call. It was a world lifer for many and I wonder if one of us will now be able to pick one out on migration? Moltoni's Warbler, Isla de Cabrera, May 2016. As well as the numerous and delightful Balearic Warblers, which are the most conspicuous breeding birds on Cabrera and reach their highest density here another special attraction is the endangered Lilford’s Wall Lizard Podarcis lilfordi. Extirpated from Mallorca and Menorca by cats and other introduced predators, this Balearic endemic lizard can still be found easily on the smaller islets of the archipelago. It has some interesting relationships, pollinating some plant species endemic to the Balearic Islands as well as being found moving to the nests of Eleonora’s Falcons, where it feeds on the remains of prey items. Cabrera is even more exciting for Spanish birders. It is more or less Spain’s equivalent of Fair Isle, having hosted numerous country firsts like Eastern Olivaceous Warbler, Cretzschmar’s Bunting and Semi-collared Flycatcher. Although our visit came at a good time for extreme vagrants we did not have the easterly winds needed to bring the true megas from the Balkans and further east but Dani was happy to make do with wall to wall sunshine and finding Spain’s third or so spring Common Rosefinch, a female type feeding at the grassy clearing by the picnic tables, Cabrera’s main migrant trap. Also here were numerous Common Redstarts, Whinchats, Pied and Spotted Flycatchers, Tree Pipits, flava wagtails, a few Tree Pipits and a Common Nightingale. Many of these showed ridiculously well. Many of us fancy a return visit to watch migration here! After a very pleasant stop at the island’s little bar we all spread out and did our own thing on the island for the rest of the afternoon. Some climbed the stairs to the top of the castle and enjoyed wonderful views over the natural harbor, others enjoyed an afternoon surrounded by Balearic Warblers and some simply disappeared. Booted Eagles soared high over the island, a few Pallid Swifts zoomed around the castle and in the late afternoon we headed back to the mainland, stopping off to enter a sea cave on the way. A few Eleonora’s Falcons had gathered over one of the smaller islets as we headed towards the main channel between the small archipelago and Mallorca. Common Rosefinch, Isla de Cabrera, May 2016. Another reason for our visit to Cabrera is its breeding population of the critically Balearic Shearwater. The most recent (2011) population estimate for Cabrera is a rather precise 449 pairs of a total world breeding population of 3,200 pairs, however, recent winter at-sea surveys and counts from Gibraltar of post-breeding birds leaving the Mediterranean have suggested a population in the region of 25,000-30,000 individuals. Unfortunately, despite higher population estimates, the rate of decline at known breeding colonies suggests that this species is still in severe danger. We enjoyed some great views of them, briefly in the morning blasting across the bow of our speedy craft but much more prolonged in the evening as we approached several small rafts offshore to see them patter across the waves as they took flight flashing dusky armpits as they went by. Their commoner and larger cousin, the recently split Scopoli’s Shearwater, was also here on both the morning and evening crossings and again we enjoyed some lovely views in the evening sunshine. Dani was happy to go through their ID features including their pale forehead, distinctive single black spot at the base of the underside of p10 and more extensive white on the underside of their hands. What a great way to finish a wonderful day in one of the nicest corners of the Mediterranean! Thanks for making it happen for us Dani! 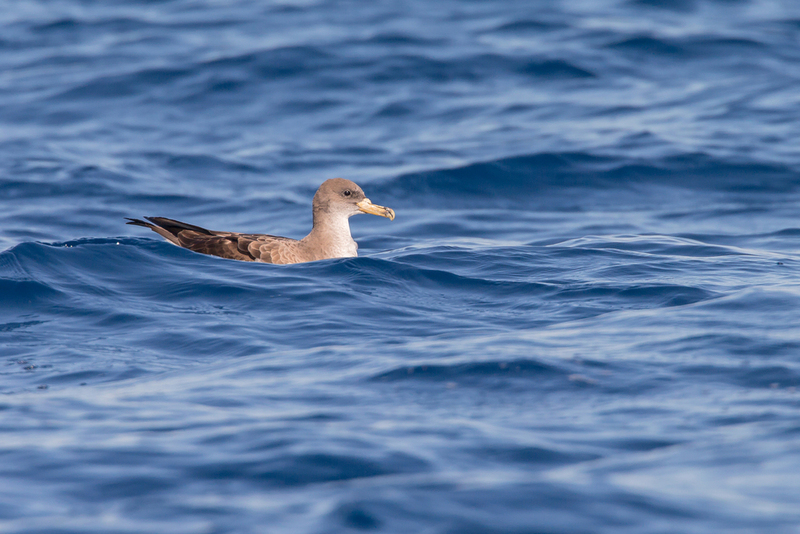 Scopoli's Shearwater, Isla de Cabrera, May 2016.